Dr. David Albin has performed 12,000 hernia surgeries and has over 25 years of experience. He is a world recognized hernia specialist. An umbilical hernia presents in or around the navel, or umbilicus. An umbilical hernia is also known as a belly button hernia. An umbilical hernia occurs when abdominal organs or fatty tissue protrudes through a small hole in the abdominal wall around the navel area. An umbilical hernia can be acquired as the result of a sudden or repetitive lifting or straining. However, some umbilical hernias are also congenital (present at birth). Even birthing mothers can develop umbilical hernias due to the pressure of the expanding womb against the naval. In adults, as time passes, the abdominal weakness grows increasingly larger which causes more abdominal contents to protrude. Sometimes, the protrusion is so extreme it distorts the navel creating an “outie” instead of an “innie”. Adult umbilical hernias can become problematic when incarceration or strangulation occurs. In this case, immediate medical attention is necessary. 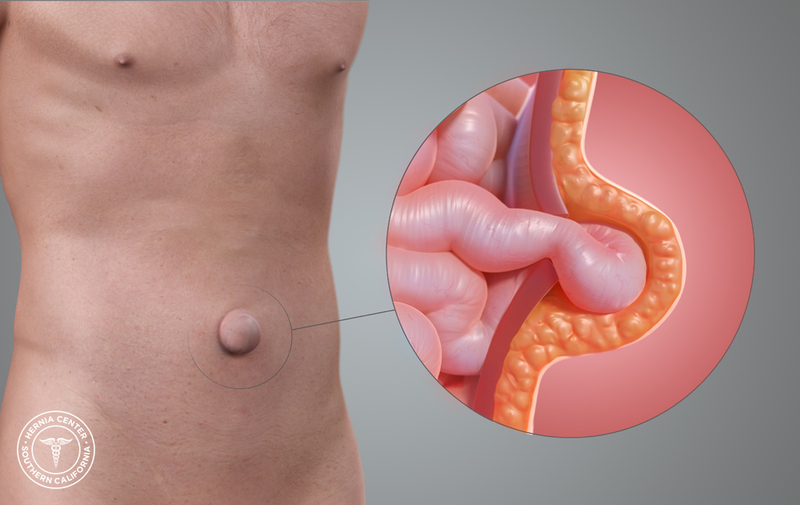 Umbilical hernias vary from person-to-person; however, the primary umbilical hernia symptom is a small, soft bulge under or around the navel area. The umbilical hernia is accompanied by pain in the abdomen; a burning sensation; and may become more severe when lifting, coughing or sneezing. Umbilical hernias do not heal independently or “just go away”. They cannot be fixed with diet, exercise or physical therapy. And beware of false claims you see on the internet – there are no pills you can take to make any hernia go away. Surgery is necessary to repair an umbilical hernia. Umbilical hernia repair methods are customized to meet each patient’s individual needs. The majority of our patients receive the open “tension-free” mesh technique. Umbilical hernias surgery can be performed by our hernia surgeons with and without mesh as well as the laparoscopic method. Female umbilical hernia patients needing an umbilical hernia surgery frequently request the “key hole” technique whereby the umbilical hernia repair is performed through a hidden incision in the umbilical region. This method is preferred most by models and actresses, because it results in no visible scar. Umbilical hernia surgery is generally performed under a local anesthesia with sedation and patients are typically allowed to return home the same day, requiring little or no medication. We cater our anesthesia to each patient’s individual needs. Many of our patients are able to choose their preferred anesthesia method: Local anesthesia, general anesthesia, and local anesthesia with sedation are the three types of anesthesia provided. All or our patients receive a local anesthetic that will numb pain from four-to-six hours. Upon waking, there will be no immediate post-operative pain. The umbilical hernia recovery period is approximately one hour. Patients are discharged the same day the umbilical hernia surgery is performed with a prescription for pain pills. Most patients will require only over-the-counter pain pills. All patients are given a post-op instruction sheet to take home with them and follow. Patients will be able to return to their normal daily activities, including driving, within a couple of days. Dr. Albin is a well recognized expert in umbilical hernia repair. The Hernia Center of Southern California specializes in all types of advanced open and laparoscopic hernia surgery. Dr. Albin has performed over 12,000 hernia surgeries in 25 years. His surgical practice is limited to the diagnosis and treatment of hernias. He is truly the hernia specialist. Patients see Dr. Albin from Los Angeles, Orange County, Riverside, San Bernardino and San Diego Counties as well as throughout the United States. The Albin Tension Free Mesh Technique is recognized worldwide.